According to tradition, the kingdom of Rome began in the mid 8th century BCE. Despite its centuries of existence, Greek scholars did not start taking serious interest in Rome until the 4th and especially the 3rd century BCE, by which time Rome had become the undisputed dominant power in Italy and began clashing with its Mediterranean rival, Carthage. The Romans, themselves, apparently never produced a historian until around 200 BCE, around which time Senator Quintus Fabius Pictor began writing the first official native Roman historical works. Unfortunately, by the time Pictor began writing, much of Rome’s written records were likely destroyed in the Gallic sack of Rome in the early 4th century BCE, and the surviving oral history about Rome’s founding would have been incredibly corrupted after untold generations of retellings. Therefore, when a Roman scholar such as Livy (c. 59 BCE-17 CE) set out to tell the story of the founding of Rome, he had to work with dubious documentation, such as historic names without historical context, and folkloric tales that were often adapted to the structure of preexistent stories of Greek mythology. The tragic and disturbing tale of the Horatii and the Curiatii is one of the myths that Rome created as an explanation as to how Rome expanded its influence over the nearby community of Alba Longa. Historically, Alba Longa is believed to have been in existence well before 1,000 BCE and was a powerful city in Italy until the 7th century BCE, when it was presumably challenged by Rome and ultimately destroyed around 600 BCE. While we will never know specific details of the conflict between Rome and Alba Longa, writers such as Livy preserved the conflict, albeit in a dramatic and embellished fashion, within their works on the folklore of early Rome. In his History of Rome, Livy alleged that the war between Rome and Alba Longa began because of a cattle dispute. As the story goes, both cities were stealing the livestock of the other and neither side wanted to return the stolen property. War was eventually declared to settle the issue, but before battle commenced, the leaders of the cities agreed to an odd solution—the war would be settled with a duel between chosen champions of each city. Oddly enough, both Rome and Alba Longa chose as their champions trios of triplet brothers—the Horatiii and the Curiatii. 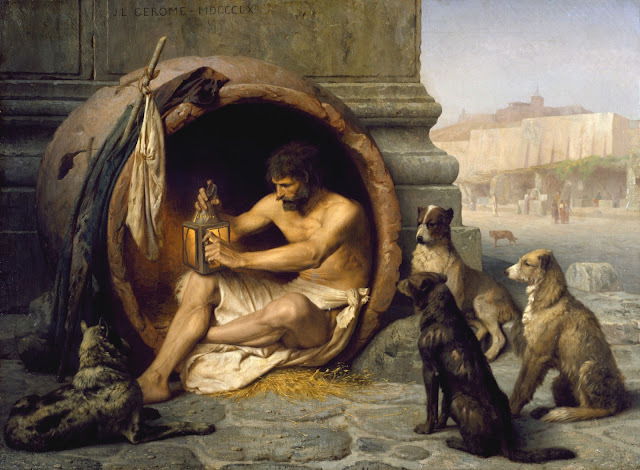 According to Livy, there was some debate as to which set of brother belonged to which city, but most accounts of the tale placed the Horatii in the Roman camp. The match-up between the Horatii and the Curiatii was unfortunate, for the Roman triplets were all set to be brothers-in-law of one of the Alban triplets, as a sister of the Roman Horatii had been recently engaged to marry one of the Curiatii brothers. Nevertheless, one of the themes of Livy’s tale was that the city is more important than love and family, so, naturally, the Horatii and Curiatii all agreed to fight to the death on behalf of their homelands. The soon-to-be-married brother from Alba Longa, however, did not shed all his emotion—when he arrived for the duel, he was proudly wearing a cloak that had been lovingly made for him by his betrothed. The six warriors entered a list, or arena, set up by the two armies, and the duel began to the sounds of trumpets and cheers. Livy painted the scene of the duel with great attention to drama. To the horror of the Romans, their Horatii triplets fought terribly. The Roman brothers fell in quick succession until only one, Publius Horatius, was left alone to face all three Curiatii siblings. Staring down the three warriors, Horatius could think of only one strategy—to run. The Romans looked on with dismay as the three Alban warriors chased the lone champion from Rome around the arena. Yet, Horatius was sprinting around the battlefield for a reason. As the Alban champions were chasing their prey, they fell into a single-file line. Seeing an opportunity, Horatius suddenly stopped and began his attack. Using good footwork and well-placed blows, the lone Roman sliced through his three pursuers, dropping one after the other as they raced toward him individually. The Romans cheered as Horatius killed the first Curiatii and then the second. For his final opponent, Publius Horatius faced the man who would have been his brother-in-law if war had been avoided. Showing no mercy, the Roman killed his foe and even looted from his body the cloak that was handmade by Horatius’ sister. With the duel over, the Albans were said to have made momentary peace with Rome. Noncombatants waiting with anticipation in Rome for news of the duel could see the Roman army celebrating on the road as it returned home. At the forefront of the Roman troops was Publius Horatius, proudly wearing the plundered bloodstained cloak that had been made by his sister. While the population of Rome cheered for the army’s valiant return, one woman at the Capena gate could only cry. According to Livy, the betrothal between Horatius’ sister and the slain Curiatii warrior was not a coldly arranged marriage for politics or wealth, but actually a union of genuine love and affection. Therefore, when the sister saw her brother wearing the bloodied cloak that she had given to her beloved, she could not suppress her grief and bawled for all of Rome to hear. Publius Horatius, enjoying all of the cheers and praise, soon heard someone killing the triumphal mood with wails and sobs. The sound of someone not appreciating his victory annoyed him and his anger did not abate even after discovering it was his own sister who was crying. At this point, the tale takes an incredibly dark turn. Instead of consoling his distraught sister, Horatius did the unthinkable. He grabbed a sword, angrily marched over to his sobbing sibling and plunged the blade deep into her chest, piercing her heart. As she bled to death, Horatius growled abuse over his sister’s body: “’Take your girl’s love,’ he shouted, ‘and give it to your lover in hell. What is Rome to such as you, or your brothers, living or dead? So perish all Roman women who mourn for an enemy!’” (History of Rome, Book I, section 26). To Rome’s credit, the myth states that the Romans immediately arrested Horatius and put him on trial for murder. Yet, the murdered sister was not given justice by the court. The Roman populace cried out for Horatius to be spared, and even the father of the Horatii (who had lost two sons and one daughter that day) spoke in defense of his son. The only way for the father to save his last living child was to besmear the memory of his own daughter. Livy wrote, “In the course of the hearing the decisive factor was the statement of Horatius’ father, to the effect that his daughter deserved her death” (History of Rome, Book I, section 26). With such pleas on his behalf, Horatius was said to have been acquitted with almost no punishment. Livy traced the origin of a mysterious wooden gateway, the Tigillum Sororium (Sister’s Beam), to this myth. He alleged that members of Horatius’ family had to regularly pass under the Sister’s Beam gate as a sort of penance for the murder. Ironically, the Curiatii triplets, the two Horatii brothers and their tragically slain sister all died for nothing. 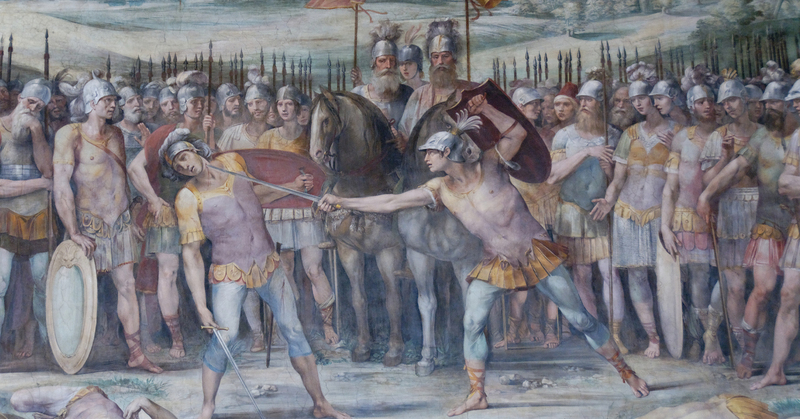 According to the tale, the Albans resumed their hostilities against Rome after the duel. In response, Rome once again went to war and this time destroyed the city of Alba Longa. In the end, their deaths only served to convey the theme that the city of Rome was more important than individual Romans, the bonds of family and the cherished emotion of love. Picture Attribution: (Painting depicting the myth of the Horatii and the Curiatii, by Giuseppe Cesari (1568–1640), [Public Domain] via Creative Commons). The History of Rome by Livy, translated by Aubrey de Sélincourt. New York: Penguin Classics, 2002.